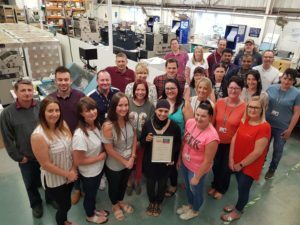 Checkprint, part of the TALL Group of Companies, the UK leader in the provision of secure paper and electronic payment solutions, has received special recognition for the community work it delivers across schools and colleges. The organisation was named the winner in the ‘Outstanding Contribution to Education’ category at Leicestershire Cares’ annual celebration. Leicestershire Cares is a not-for-profit organisation that helps businesses to find volunteering placements. Checkprint signed up as a member in January 2017, pledging to participate in a number of projects designed to benefit the local community. Since working with Leicestershire Cares, Checkprint staff have delivered regular lessons to Year 3 & 4 pupils from Battling Brook Primary School, helping students to improve their maths skills. They have also visited Hinckley Academy to carry out reading lessons for 11 to 14-year-olds, whilst providing school leavers with training sessions on interview techniques to help them find suitable employment opportunities. This activity helped Checkprint to beat off stiff competition from Howes Percival, Office Depot and Melton Foods to secure the award, which was presented during a special celebration at Winstanley House in Leicester on Tuesday night (15th May). Earlier that day, a team from Checkprint had joined local Hinckley & Rugby Building Society staff and Hinckley Academy staff and students at Hinckley East Sure Start to apply a lick of paint to fences, garden furniture and buildings at the centre in a Leicestershire Cares challenge. The Hinckley East Sure Start centre offers pre-school age children and their families a range of services that are tailored to the needs of the local area but meet the government’s targets to improve the lives for pre-school children and their families. Checkprint has also taken part in a number of other Leicestershire Cares initiatives over the last 17 months. Last summer, nine staff members rolled up their sleeves to take part in an eight-hour painting session as part of a project to refurbish a playground in Braunstone. In addition, team members also took part on a food bank challenge in Fairshare and an Age UK event in Leicester. The TALL Group of Companies has been named as one of the 50 fastest growing companies in Greater Manchester.